Following on from parts 1, 2, 3, 4, 5, 6 and 7, I thought I'd blog some of the other field ordering preferences I've encountered. We'll then add a custom FieldOrderPropertyStyle to lookup this helper class and order the fields. 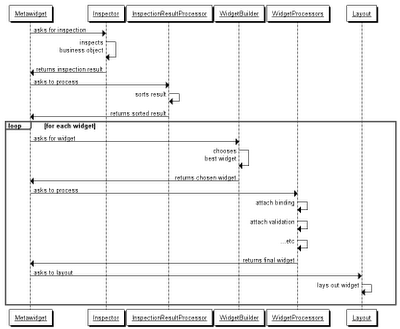 Example implementation below. // ...start a new source file..
Special thanks to Bernhard Huber and Stuart Douglas for their help with this release! Following on from parts 1, 2, 3, 4 and 5, I thought I'd blog some of the other field ordering preferences I've encountered. Following on from Part 1, Part 2 and Part 3, I thought I'd blog some of the other field ordering preferences I've encountered. Following on from Part 1 and Part 2, I thought I'd blog some of the other field ordering preferences I've encountered. Out of the box, Metawidget supplies UiComesAfter and ComesAfterInspectionResultProcessor to let you order your fields on a 'per domain' basis. But of course there are other approaches. Following on from Part 1, Dan asked whether the screen could decide based on some kind of 'view groups', rather like Bean Validation's validation groups. I actually like this idea a lot: it combines the flexibility of local field ordering with the safety of not hard-coding field names into the screens. Having said that, this is the first time it's been suggested. So I'll wait and see if it becomes popular before deciding whether to provide it 'out of the box' (this blog series will explore a lot of alternate preferences). To see it in action, try running the code and changing the 'putClientProperty' line to use different view groups (ie. 'summary' or 'detail'). "One thing that I think would really help people along is to have an example of how to customize form fields displayed on a JSF view. This seems to be one of the first thing any JSF developer wonders about. I know that customization is possible, both at the global and field level, but just having a simple how-to would go a long way"
This is a great point, worthy of a little blog series. Out of the box, Metawidget has a few different options for ordering fields. I'll just mention the most simple ones here. InspectionResultProcessors sit after the Inspectors and before the WidgetBuilders. 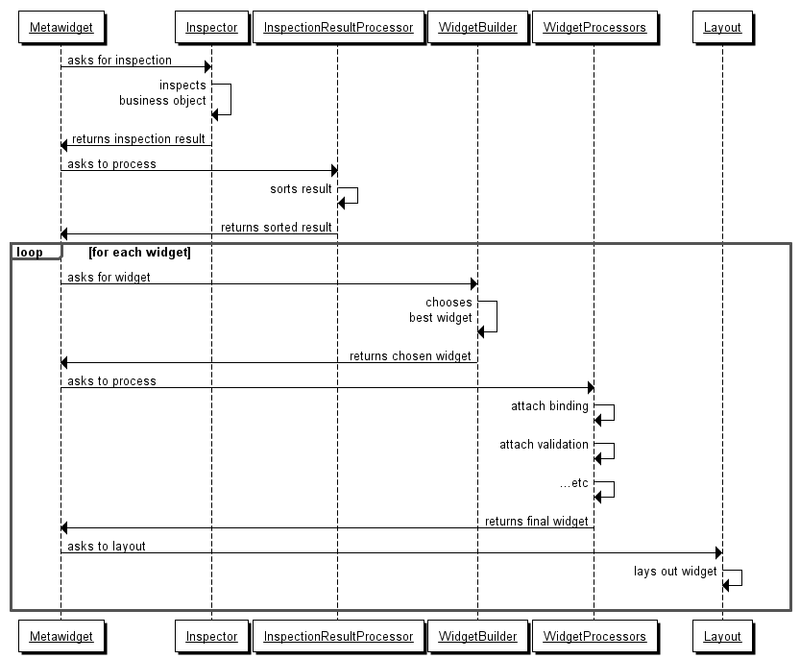 Out of the box, UiComesAfter is implemented using ComesAfterInspectionResultProcessor. But InspectionResultProcessors have access both to the inspection result and the Metawidget that is about to render it, and this vantage point gives them a number of capabilites. One capability is to allow the screen to choose which fields it should render. Now, I don't particularly recommend this approach: it means your screen contains hard-coded field names. These won't refactor well, nor will they evolve well as your business objects evolve. But, hey, Metawidget is all about working the way you want to! If this approach happens to be your preference, you may be surprised you have to code an InspectionResultProcessor for it yourself - why doesn't Metawidget support it out of the box? However, you may also be surprised at how many other preferences there are, as we shall see later in this blog series. Metawidget isn't about providing flags for every possible variation: UI requirements are too diverse for that. Instead, Metawidget tries to be pluggable enough, in enough places, that you can always tweak it to suit. Note this can include actions (like 'edit' and 'save') as well as properties. More InspectionResultProcessor examples to come!